If the skirt steak and chimichurri is my new easy summer dinner, then this is my new summer go to dish-- Orzo with Artichoke Pesto, Grilled Corn and Tomatoes. It's a great light dinner, side dish (with grilled chicken would be yum) or the perfect lunch. Neither Andy nor I are big artichoke people-- love the flavor, not keen on the texture. Well, this solves that problem since the artichokes are pureed in the pesto. Combine all of the ingredients in a food processor and pulse until combined. Prepare orzo according to the package directions for 4 servings (224g uncooked). Shuck the corn and rub it with a little olive oil. Place the corn directly on the hot grill and cook for about 4 minutes, turning to grill all sides. After it's cooked, cut it off the cobs. 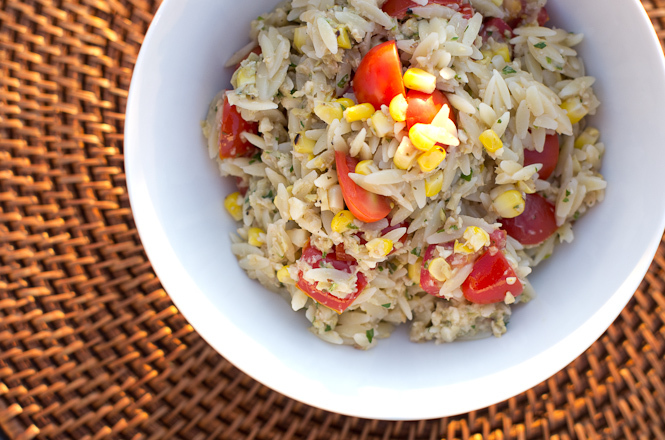 In a large bowl, combine the cooked orzo, corn and tomatoes. Top with pesto and toss until combined. 1 comment on "Orzo with Artichoke Pesto, Grilled Corn and Tomatoes"